Acoustic guitar amplifiers process guitar signals differently than electric guitar amps. The signals of an electric guitar are produced by the coils in the pickup. 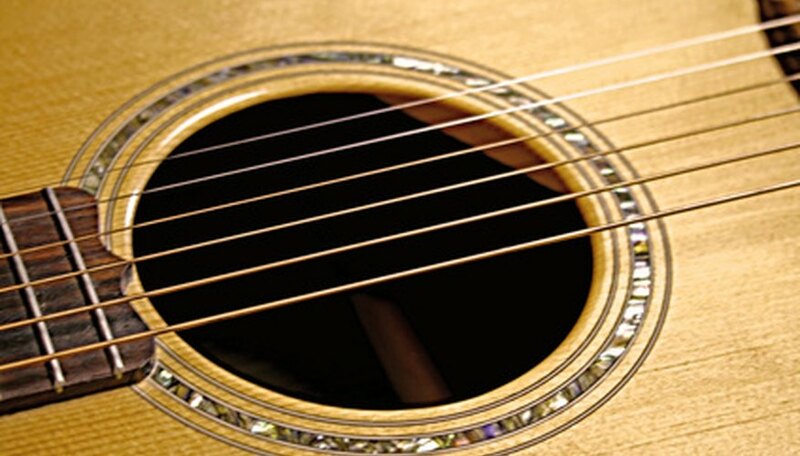 Acoustic guitar signals are created by microphones in the pickup. Electric guitars therefore produce a high impedance signal while acoustic guitars produce a low impedance signal. Building an acoustic guitar amp is more akin to building a small public address system than it is to building an electric guitar amp. The job of the amp is to generate a sound as close as possible to that of the acoustic instrument, without noise and feedback. Source your parts. The easiest approach to building an acoustic amplifier is to salvage parts from old or broken acoustic guitar amps. An acoustic guitar amplifier has three main components: low-impedance microphone preamp, power amp and speaker. You can use a cabinet from an electric guitar amp, or you can build your own. Elliot Sounds Products is an online amp parts retailer whose website lists a range of low-impedance microphone preamps. Prepare the cabinet. If you aren’t salvaging a cab, build your own. Measure the internal parts and cut the wood so the cabinet is oversized by at least 2 inches. This will accommodate parts upgrades and give you more room to work. You need four equal-size pieces for the top, bottom and sides. The back panel must be as wide as the top and as high as the sides minus the height of the preamp. This gives you a back panel that exposes the rear of the preamp at the top. Cut a final piece of wood to act as a shelf. This is where the preamp and power amp will sit. Use a slotting file to create a groove on the inside of each side panel for the shelf to slot in. Cut two 1-inch-thick struts that are 1/2 inch shorter than the width of the top. Glue them to the inside of the top and bottom panels, respectively. Cut two more 1-inch-thick struts 1/2 inch shorter than the depth of the top panel, and glue them just below the groove that you created. Slot the shelf into the groove. Glue the top, bottom and sides together but don’t attach the back. Nail the corners together when the glue is dry. Solder the input jack and potentiometers to the printed circuit board. Mount the printed circuit board into the preamp chassis and screw on the chassis top. Install the preamp. Slide it into the shelf at the top of the cabinet. The dials must be exposed at the front. Install the power amp. This sits at the right of the preamp as you face the front of the amplifier. Screw the speaker into the struts. Use 1-inch long screws. Solder a wire from the preamp chassis output terminal to the power amp. Then wire the power amp output terminal to the input terminal of the speaker. Screw in the back panel. Follow the wiring schematic that comes with the preamp. If you are salvaging the parts, get a wiring schematic from the same manufacturer. The 'Free Schematics' website has an archive of wiring schematics. After you solder your parts, check the chassis for solder blobs. Solder blobs can divert the signal away from the intended destination. Melt away any solder blobs with your soldering iron.